can i omit the yeast? You can’t, cause the yeast helps to give the steamed cake a honey comb texture. is this pak tong kou the one we can get in dim sum? I love it very much but never tried to make it. I sahll try to do it with your recipe, hope I can measure it with grams, here in Canada we use cups. Please tell me what do you cover it with to leave it to leaven? a cloth or tight lid? I am glad to hve discovered your website Take care. Yes, this is the springy type which is made with either white or brown sugar. Normally I’ll cover the pot with a tight lid and leave it in a warm place. Hope you will like it. Ii’s so great to know your website. It’s fantastic. Thanks very much for sharing your recipes, especially thi cake. I love this cake very much and will make it. Thanks again for all you kindness. Yesterday, I was so happy that atlast i found this recipe here, for i’ve been searching through so many sites. I wanted to expressed immediately but i wanted to give a try and so today morning i got a wonderful Pak Tong Kou. It came out well and that its so easy to make, its not at all difficult. Thank you for sharing what u have with everyone here on the net. Its great! And its a honour! I wanted to try other new recipes as well, but i dont know how it looks, so if you could post along the recipe with the photo it would be excellent! Thanking you again. 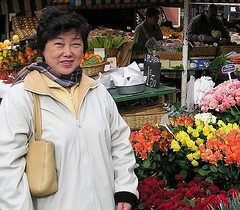 Glad that you got a wonderful Pak Tong Kou. Sometimes I used light brown sugar and it tasted very good too. Thank you for your suggestion. I’m looking into it. Look at your cake, I can tell it tastes great. I made this cakes some times but it turned out not as white as yours 😦 WHat kind of rice flour do you use to make this cake Rose? I use Sunflower brand or Elephant brand from Thailand, the flour is very fine. Maybe you want to try putting a tiny cup of vinegar besides the tray whilst steaming and let’s see if it will prevent the cake from turning yellow. Did you mean that putting vinegar in the water of the steamer? I was taught to place a tiny cup of vinegar in between the paus (chinese buns) whilst steaming so that they will not turn yellow. Maybe you want to try adding to the water and see what happens. Hey! Thanks so much for sharing this recipe. It’s one of my childhood favourites. Bought one recently and it did not taste good so am glad to find your recipe so I can make it and share it with my young son. It is my pleasure. Hope both of you will have a good time making and sharing the Pak Tong Kou. You have to use rice flour for this recipe. Is there a substitute of Pandan Leaf? I’ve never seen it before. I just tried to make it and it taste like the ones I’ve had from the store, but I can’t get it to set. I even steamed it longer than 20 minutes and its still liquidy in the center… is there anything I can do? You can substitute pandan leaf with pandan paste. As for your Pak Tong Kou, probably it is not well leavened and you have to steam it over very high heat. If you don’t have pandan leave or paste, try real vanilla extract. It taste pretty good too, but not as good as the pandan leave. Thanks for sharing. I’ve tried using rose syrup and it tastes pretty good too. Most of my recipes are in ozs and I’m so used to. Now that I’ve to convert them to gram and ml. Maybe you can refer to roseskitchenette.com for the Standard Conversion Tables. I tried making this today, but mine didn’t turn out well,it is kind of hard in the centre and soft at the outside. Basically didn’t turn out springy. what could have gone wrong? What i did diffferent was only using instant yeast rather than fresh yeast. Thanks for sharing! If the dried yeast doesn’t turn frothy when dissolved in the tepid water, discard. Secondly, I think the mixture has not been leavened enough. Wish u success in your next attempt. Thanks so much for this recipe. It’s so simple and easy and the best thing is that the results are fantistic. All my friends loved it eventhough I didn’t use the pandan leaves. can i omit the salt? I tried this recipe,but it turns yellow and hard,do I need a bamboo steamer for this?Is vinegar will help to maintain white color? Thanks for this Pak Tong Kou. Could I use some cake flour (about 20%) instead of rice flour(80%)??? If not, how do i make the rice cake rise better/higher with more pronounce holes? Is Pak Tong Kou the same as Bok Tong Go??? Your recipe looks a lot easier…no fermenting for 2-3 days! Where do i find your conversion table from grams to lbs and/or tesapoon, tablespoon measure??? I will be trying this recipe today! Very nice website…your son does a good job…thanks for sharing your recipes. I made this cake and it is wonderful. Thank you Rose. God bless you! Hi Rose, I want to make this cake again,can I replace a half of water with coconut milk?Do you have apem cukit recipe, a cake from Indonesia?Thank you. You can only use rice flour and should let it sit for 8 hours to let the yeast work into the rice. Hi Rose, thank you for sharing your wonderful recipes. My youngest daughter loves Pak Tong Kou. Since we moved to NZ, it’s impossible to buy so I tried your recipe and it turned out to be yummy. Also tried your banana cake recipe. My friens loved it. May God continue to strengthen you. Thank you so much for your recipes. I love to bake & cook. I have tried some of your recipes. They are so yummy, & easy to make. You are so kind to share. May God bless you forever. Hope you will continue to update. steam this over low heat or medium low? also, can i halve this recipe? I wanna steam this in a wok and can’t seem to find any 30cm tray here in australia and even id I do find them, can’t possibly fit that in a wok. Please help, thanks a million! My son loves pandan cake and it is not easy to find them in Norway. I have been looking all over the website for recipe and finally with the help from my sister found your website. My kids will be so happy that mommy can bake Pandan Cake for them. Millions of thanks to you! I’m glad to have found this website. I’ve been looking for the recipe for this white sponge cake for years now. My 4 years old son loves to eat them and everytime we go shopping down at the asian place in Charlotte, we had to stop by to get some but lately, they haven’t made them at the market. Anyways, I tried making your recipe twice and it just wouldn’t come out right. I followed your instructions but somehow, I feel I’m doing something wrong or missing something. I’m about to give up!!!! HELP!! Hey does this recipe work if I omit the pandan leaves and use instant yeast instead of dry active yeast? If so, how do I make the conversion between dry active yeast to instant yeast? Thanks in advance! I love the recipes that I just discovered on your site. They are wonderful.The Pak Tong Kau as our family’s favourit turns out very well. I was wondering if you have the recipe of Bak pau ( steamed buns with pork fillings). If so please can you email it to me? Thank you for your generosity and may God always bless you. I like this cake, but I don’t how to make it. Where can I get the yeast? What is the name of the yeast? Thanks for all the receipes, tried hainanese chicken, lovely. There is so many recipes for this dish, but like yours the best. Where do you learn to be such a good cook. Glad you like the chicken rice recipe. I learnt it from a chef at one of the top hotels a long time ago. It would be a waste not to share! Happy cooking! Your blog is lovely and I absolutely love pak tong goh..
however, I tried making it today and it turned out to be very sour, like very sour. Do you think it would be something wrong with my yeast? Hi Rose,thank you so much for your simple and easy recipe.Can i less the sugar instead of using the same amount with the rice flour,i found it is too sweet.I am very happy with your recipe and i am going to try every each one of your recipes again in future.May God Bless you Rose. You can adjust the sugar to suit your taste. Hope your Pak Tong Kou turns out well. Wish you a Blessed New Year 2010! I tried making your Pak Tong Kou for the lst time today and it turned out good except I still find it a bit ‘nuah’ nuah’ (sticky)still and not q q altho the honeycomb texture was well formed. Could it be due to the rice flour? Also I find the amount of sugar used is too sweet for our family taste buds. Will reducing the sugar affects the texture? Tried this recipe too. And it turned out nice but as mentioned by Donna, it a bit ‘nuah’. Y ah? otherwise, it is perfect. And the sugar, I only put 200g, but still we find it sweet. Might reduce it again nex time. Thanks for the great n simple recipe! Thanks for your feed back. Of course you can reduce the amount of sugar according to your taste. 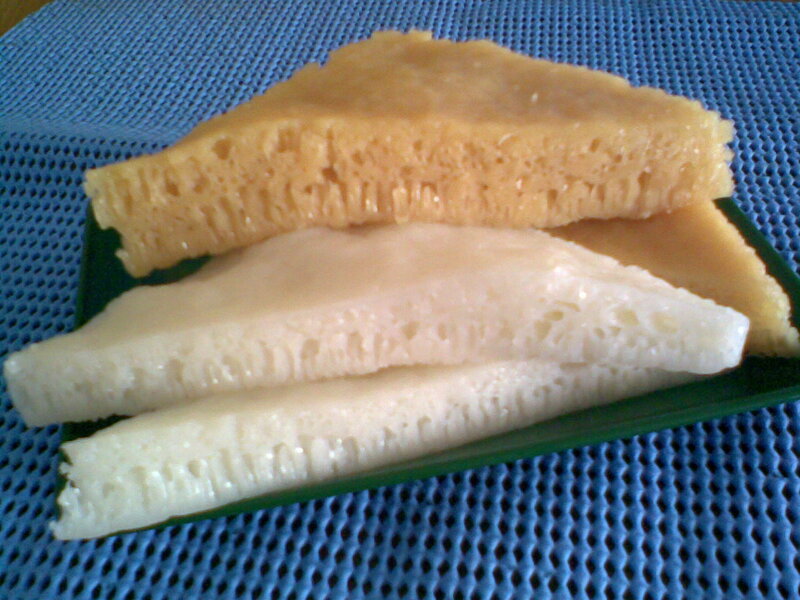 As for the texture of the kueh, I think it is due to the rice flour. 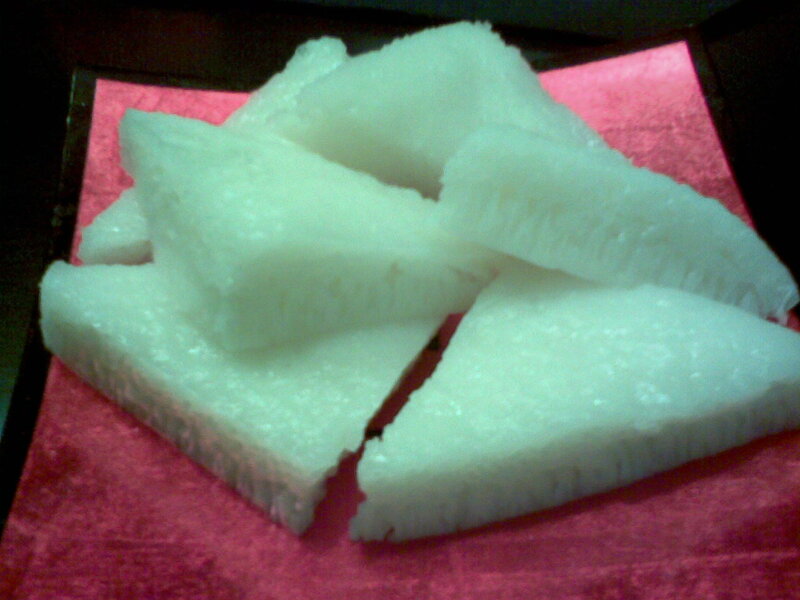 I have encountered a few times using rice flour for making steamed yam cake which turned out gooey also. Try a different brand and see if it works. Regards. Thanks for deciding to share your recipes. I found your site while searching for Pak Tong Koh. I’ll let you know how it turns out! — God Bless you and keep you well. This sounds amazing. I can’t find the pandan leaves at my local store so I’ll look at a Korean grocery by me. Can’t wait to try it as as seems like a unique taste. First of all Happy Mothers Day. What kind of syrup will be poured? Can I do away the pandan? Is this the rice cake that is a little sour, salty and sweet? can i use a metal steamer? Hi Manuel, I have tried using a metal container and it came out fine. All the best. 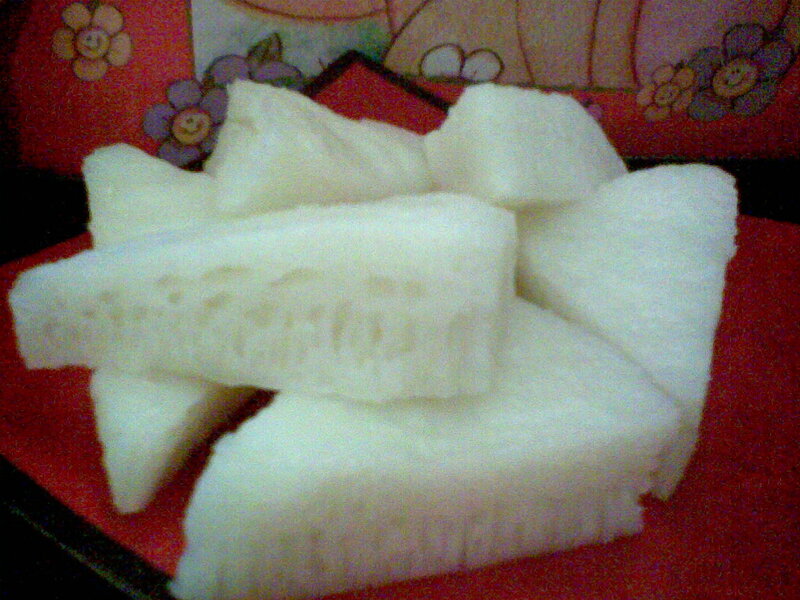 i love this rice cake too. thanks for sharing this recipe. may God bless u always. Thank you Mary. God bless you too. hellò Rose, i’m a foodblogger italian and i think that you’re recipe are very very good!!! If you want, visit my blog. Thanks for your support and feedback. Lately, I have been very busy so have not posted new recipes. I will visit your blog. do you add the flour mixture? How long do u continue boiling it for once the flour is added? Is it meant to turn into a thick mixture with little lumps? I had tried your resepi, but sorry to tell you that it is too soggy, I believe the amount of water should be much lesser. I just made your recipe today…it actually worked for once. The only change I made was reduce the sugar. I had tried 3 previous recipes and they didn’t even come close. Thanks!!! dollhouse wicker furniture is made with wire or really small wood strips. in the middle when it’s done?! I made this today. Flavor was right, but it felt dry and less bouncy as compared to Chinese restaurants. Could it be not enough oil? Also, do you think the restaurants use rice flour or actual rice and grind it? Thanks so much! I have tried so many different web on this sweet but none came out as good as yours. Thanks Rose really enjoy it. Hihi…May I know What type n brand of yeast are you using? Any pic to show? How do you get that flat glossy top like that? Mine is never like that, it always looks risen and bubbly. Also what kind of yeast do you use? All recipes I have tried use regular active dry yeast but they have a weird flavor compared to when I get it in Chinatown it has more wine yeast flavor. If I use a smaller pan so I can get higher cake, do I adjust the steaming time? Like by how much? Thank you! !